Secret Buddha Statues are enshrined in special tabernacles called zushi 厨子 and are shown at regular intervals to the public. Some are shown every year, others every seven, seventeen, thirtythree or hundred years only. Some are never shown. This can be a replica of the original hidden statue or a different one altogether. Usually a substitute statue ("stand before it" maedachi 前立) is placed in front of this tabernacle and can be venerated in prayers at any time.
. hibutsu　秘仏 secret or hidden Buddha Statues .
. Koyasan, Namikiri Fudo 高野山 波切不動明王 .
. Yokoyama Fudo 横山不動尊 .
. Zuigan-Ji 瑞巌寺, Godai-Do 五大堂 . These statues are important cultural property 国重要文化財. 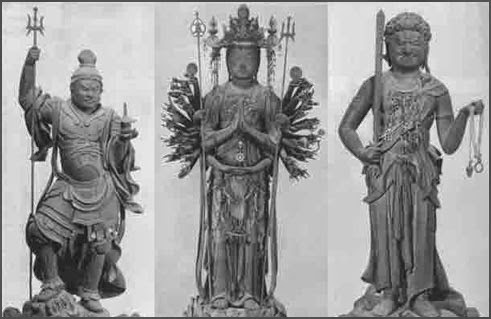 The statues are from the late Kamakura period. These statues are shown once every 33 years, from October 17 to November 23.
hibutsu secret statue, shown only once a year. The Statue is 109 cm high and made from hinoki 檜 cypress wood. The present-day priest is the 17th in a long family tradition. He is a very open man and holds music events and yoga lessons at the temple. He often walks around in blue-jeans to show he is just another simple person. Japanese daimyo during the Azuchi-Momoyama and Edo periods around the turn of the 17th century. His father was Ikoma Chikashige. 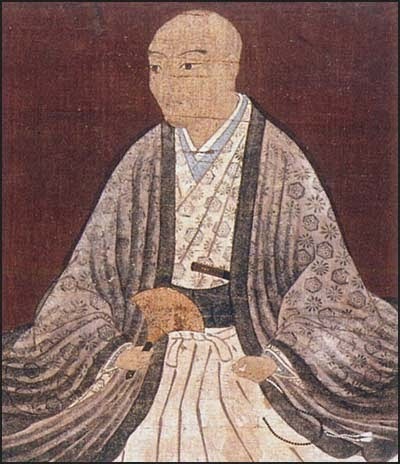 Chikamasa was appointed one of the three chūrō (arbiters) by Toyotomi Hideyoshi. In 1566, he became a retainer of Oda Nobunaga when he attacked Mino Province. He worked under Hashiba Hideyoshi (Toyotomi Hideyoshi) from then on, and was involved in various battles such as the Battle of Nagashino, the battle against Ishiyama Hongan-ji and the battle against the Saika party at Kii Province. In 1582, he served Hideyoshi after Nobunaga died, and was active in several battles such as the Battle of Yamazaki, the Battle of Shizugatake, the Siege of Odawara, and the Battle of Bunroku. He was given lands in Sanuki Province yielding 171,800 koku of rice because of his service. In Hideyoshi's last years, Ikoma Chikamasa, Nakamura Kazuuji, and Horio Yoshiharu were appointed to the position of chūrō under Toyotomi. In 1600 at the Battle of Sekigahara, Chikamasa was part of Ishida Mitsunari's force while his son, Ikoma Kazumasa was part of Tokugawa Ieyasu's force. Chikamasa remained at Sanuki and sent his retainers in his stead to attack Tanabe castle in Tango Province. He chose this strategy to preserve the Ikoma clan regardless of which side prevailed. Because Kazumasa fought in Ieyasu's force, Ieyasu allowed Chikamasa to rule his existing domain after the battle, but Chikamasa took responsibility for fighting on the losing side by transferring the headship of the family to Kazumasa. 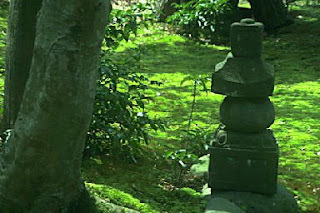 He became a priest and withdrew to Mount Koya. He was soon permitted to return to Sanuki Province. In 1603, he died in Takamatsu castle. 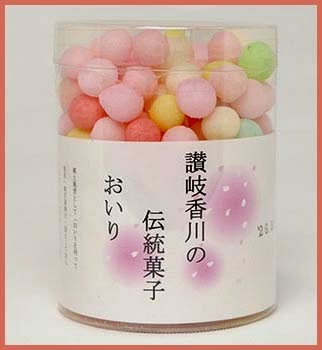 This custom started in the Edo period around 1587 when the first lord of Sanuki, Ikoma Chikamasa 生駒親正公, had them made for the bride, using five colors, pink, yellow, orange, white and light blue.
. Washoku - Sweets from Shikoku . Fudo Pilgrims to 36 temples in Shikoku . This statue had been at the temple Daizen-In 高賀山大善院. 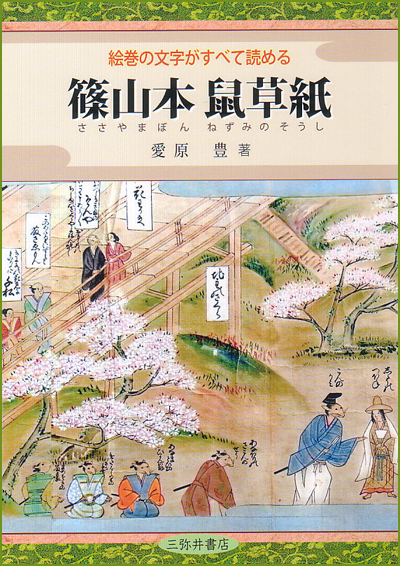 It was already mentioned in old books of the Tsugaru peninsula. 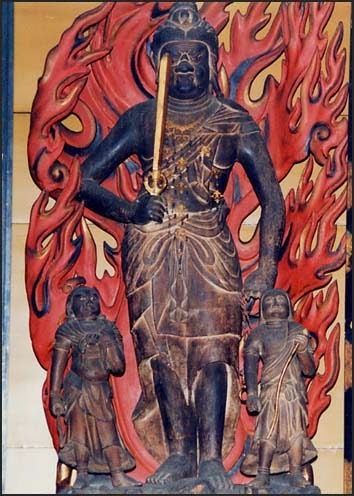 The main statue is Dainichi Nyorai 大日如来. People come here to pray for a good harvest and peace in the land. There is also a statue of 文殊菩薩 Monju Bosatsu in the temple. Saisho-In was the leading Head of these temples. 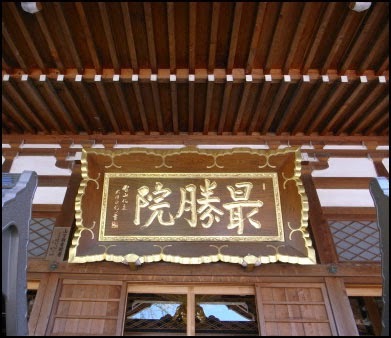 It also supervised shrines 千百三十三社 in the region for the Bakufu government in Edo. It was the most powerful temple in the region. In the Meiji period, when Buddhism and Shinto were separated, the temple was relocated from the "Demon Gate" 弘前鬼門 side of Hirosaki to its present location at the remains of 連光山大圓寺跡 Daien-Ji (now temple Nr. 22 in the Kobo Daishi Pilgrimage). 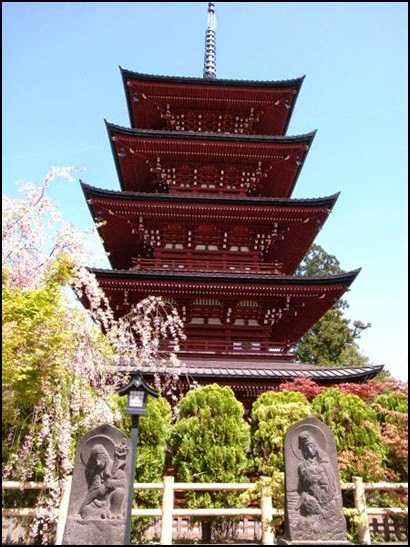 The most prominent feature is the five-storied pagoda in the compound. Speaking about Hirosaki-city, tourists always give first choice to visit Hirosaki Castle. If you had time after visiting Hirosaki Park, or if you kinda missed the best days for viewing cherry blossoms, I recommend to stop at Five-storied Pagoda which is located to the southeast of the castle park. It will take about 15 minutes on foot from the castle. 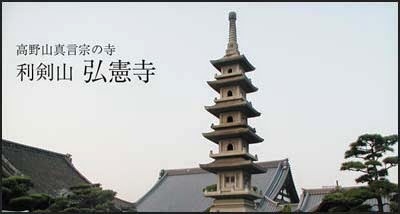 This pagoda, 31.2 meters high, was build in 1667 for the repose of the soul of fallen soldiers. It is installed in the precinct of Saisho-in Temple. 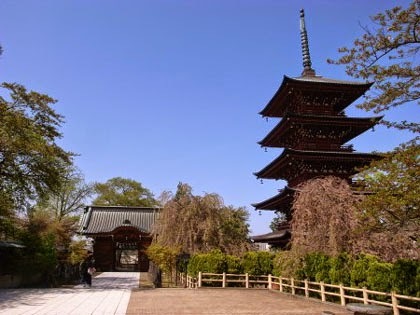 The pagoda at Saisho-in temple was built around 350 years ago to commemorate those who died in battle during the reunification of the Tsugaru district in which Hirosaki is located. It's five stories high and stands just over 31 meters tall, and is said to be the most beautiful of its kind in Tohoku. The komainu guardians are rabbits here. 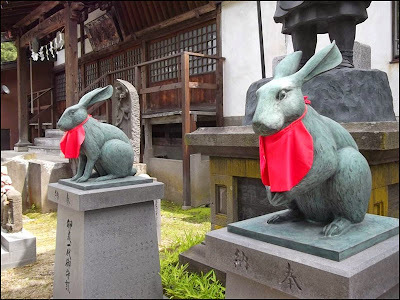 Pilgrimage to 23 Kobo Daishi temples in Tsugaru . Pilgrimage to 36 Fudo Temples in Tohoku . Let us look at the concept of a "monster cat", bakeneko, before proceeding to this special Fudo statue. This type of cat has supernatural abilities and sometimes a split tail. 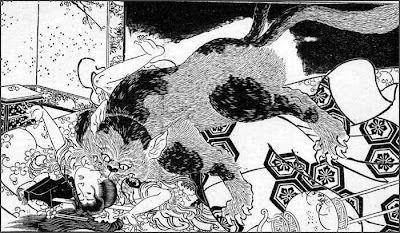 A bakeneko (化け猫, 化猫, "monster cat") is, in Japanese folklore, a cat with supernatural abilities akin to those of the fox or raccoon dog. 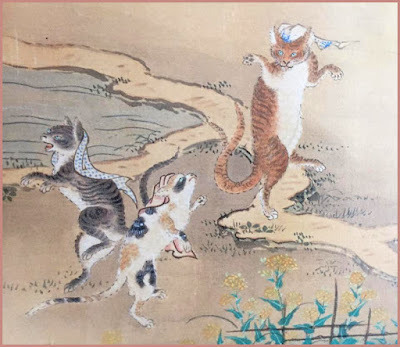 A cat may become a bakeneko in a number of ways: it may reach a certain age, be kept for a certain number of years, grow to a certain size, or be allowed to keep a long tail. In the last case, the tail forks in two and the bakeneko is then called a nekomata (猫又, nekomata,　猫叉, or 猫股 "forked cat"). This superstition may have some connection to the breeding of the Japanese Bobtail. 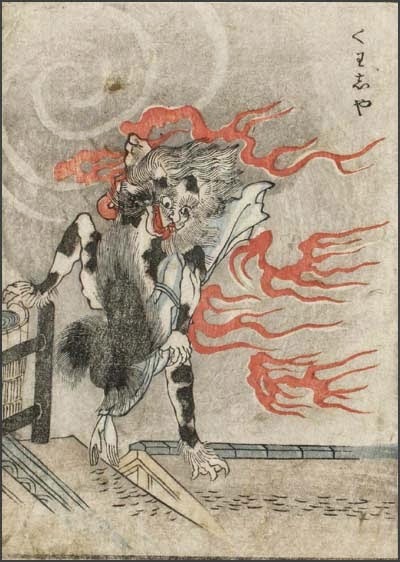 A bakeneko will haunt any household it is kept in, creating ghostly fireballs, menacing sleepers, walking on its hind legs, changing its shape into that of a human, and even devouring its own mistress in order to shapeshift and take her place. When it is finally killed, its body may be as much as five feet in length. It also poses a danger if allowed into a room with a fresh corpse; a cat is believed to be capable of reanimating a body by jumping over it. 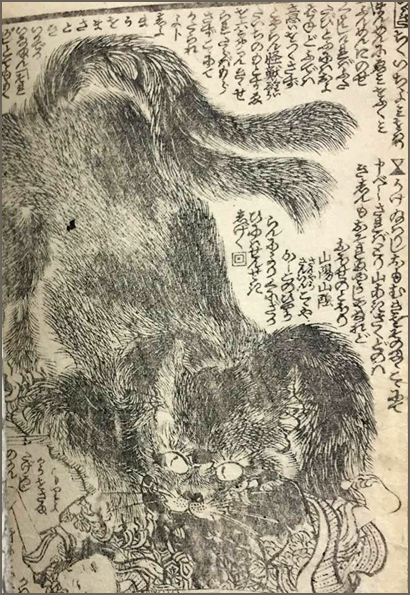 As with the nekomata, another cat-like yōkai which is said to derive from a cat whose tail split into two when it grew older, there are folk beliefs across Japan about how aged cats would turn into bakeneko. There are tales of cats raised for twelve years in Ibaraki Prefecture and Nagano Prefecture, and for thirteen years in Kunigami District, Okinawa Prefecture, that became bakeneko. In Yamagata District, Hiroshima Prefecture, it is said that a cat raised for seven years or longer would kill the one that raised it. There are also many regions where when people began raising a cat, they would decide in advance how many years they would raise it because of this superstition. Also, depending on the area, there are stories in which cats that were killed by humans in a brutal manner would become bakeneko and curse that human. 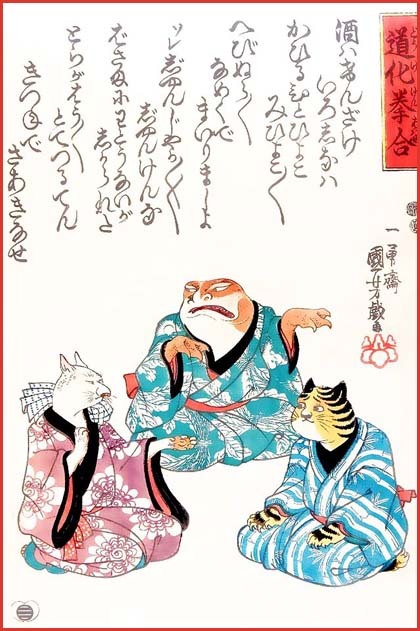 The stories of bakeneko are not only about aged cats, but are also sometimes stories of revenge against cruel humans. 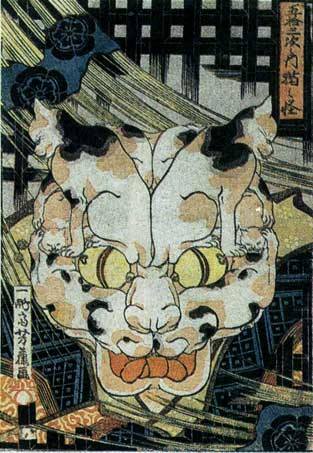 The strange abilities attributed to the bakeneko are various, but include shapeshifting into humans, wearing a towel or napkin on the head and dancing, speaking human words, cursing humans, manipulating dead people, possessing humans, lurking in the mountains and taking wolves along with them to attack travelers,[and many other things. As an unusual example, on Aji island, Oshika District, Miyagi Prefecture and in the Oki Islands, Shimane Prefecture, there is a story of a cat that shapeshifted into a human and wanted to engage in sumo. 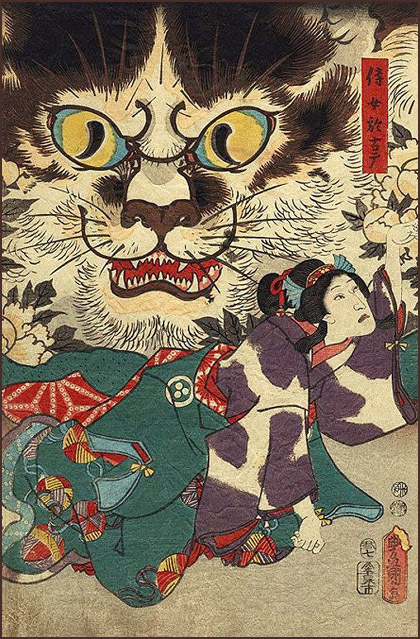 However, concerning the legend that cats could speak, it has been pointed out that it may have arisen because humans would misinterpret the cat's meowing as human language, and for this reason some would say that the cat is not a type of yōkai. In 1992 (Heisei 4), in the Yomiuri newspaper, there was an article that argued that when people thought they had heard a cat speak, upon listening a second time, they realized that it was simply the cat's meowing and that it was only coincidence that it resembled a word in human language. 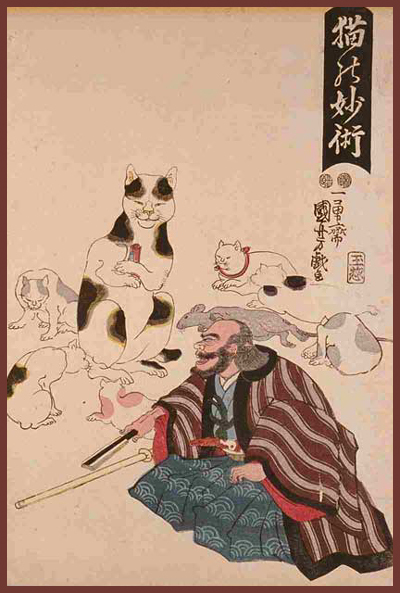 In the Edo period (1603-1867), there was a folk belief that cats with long tails like snakes could bewitch people. Cats with long tails were disliked, and there was a custom of cutting their tails. It is speculated that this is the reason that there are so many cats in Japan with short tails nowadays, because natural selection has favored those with short tails. 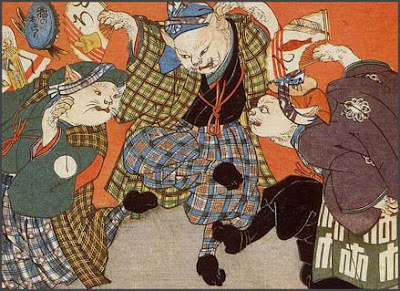 Folk beliefs that cats can cause strange phenomena are not limited to Japan. For example, in Jinhua, Zhejiang, in China, it is said that a cat, after having been raised for three years by humans, would then start bewitching them. Because it is said that cats with white tails are especially good at this, there arose the custom of refraining from raising white cats. Since it is said that their ability to bewitch humans comes from taking in the spiritual energy of the moon, it is said that when a cat looks up at the moon, whether its tail has been cut or not, it should be killed on the spot. 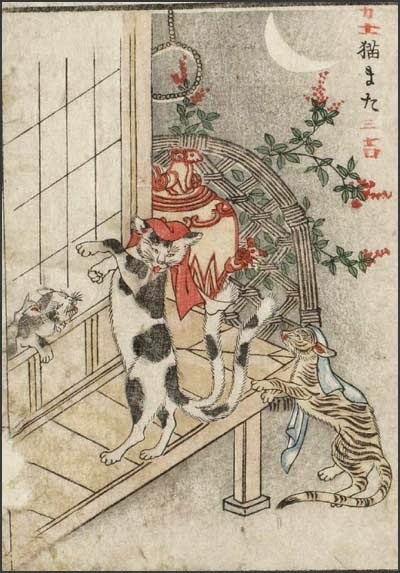 In Makidani, Yamasaki, Shisō District, Harima Province (now within Shisō, Hyōgo Prefecture), a tale was passed down about a certain person in Karakawa who was a bakeneko. - MORE in the WIKIPEDIA ! Shiranui Monogatari 白縫物語 1862 - Utagawa Kunisada. This monsterous evil cat is full of the three desires of humans 貪瞋癡（とんじんち, tonjinchi, bonno). 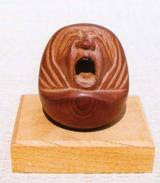 When it openes its mouth, lies, slander and bad speach come out 悪口両舌(あっく りょうぜつ, akku ryoozetsu). Its claws could kill people and it would steal things 殺生偸盗（せっしょうちゅうとう, sesshoo chuutoo）. It also had the "wicked eye" to swear and curse people 瞋恚 邪見（しんにじゃけん, shinni jaken）. Life of Cats: Selections from the Hiraki Ukiyo-E Collection will showcase woodblock prints of cats from the Edo Period (1615–1867). In many of the prints on display in the Life of Cats, cats are dignified, even courtly, animals. 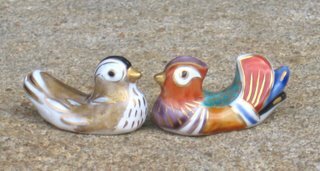 They take their place alongside well-coiffed ladies, strolling around the grounds of palaces and wielding fancy fans. Occasionally, they even don aristocratic apparel; often, they are decidedly sophisticated, bordering on human. Here now the legend about this CAT. There was a monster cat at our temple that would tempt weak and cunning people and lead them into temptation and on evil ways. Therefore people in the neighbourhood were much afraid of it. It would also lick the oil from the temple lamps and when the oil was gone and all was dark it would steal things from the altar and eat the offerings. In the beginning, one of the apprentice monks was thought to be the evil-doer and howevermuch he explained he did not steal the offerings, he was hit and thrown out of the temple. But but the evil deeds in the temple did not stop after he left. The people of the village met and discussed what to do, but nothing seemed to help. The cat would always see the ruses of people and play even more bad tricks on them. The stories of the evil monster cat made the rounds in the country and even the lord of the domain in his castle heared about it. The lord came to the temple Saisho-In and asked the head priest to engage the support of the deities. So a secret ritual was held for seven days and prayers and fire rituals for Fudo Myo-O were performed three times a day during this week. When the last day of this ceremonies came, the evil cat tried to sneek into the main temple hall at midnight and eat some of the offerings. Fudo on the alter platform raised his hand with the sword and within one setsuna he stabbed the cat right into its breast. 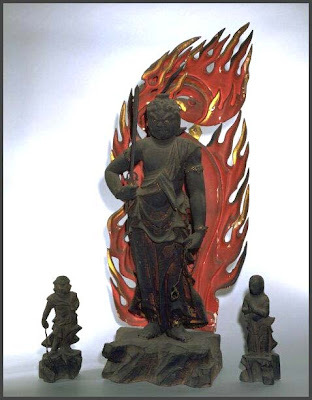 In the morning Fudo Myo-O appeared in the dream of the priest. "I have punished this evil cat. Its dead body is now outside on the west side of the temple wall. Please give it a proper burial! " When the priest woke up and went to the spot, he found a huge cat with a red mark on the breast. When he went back to the temple hall he saw red blood drip from the sword of Fudo Myo-O and his rope was in disorder as if it had just been used. So the priest burried the cat, placed a stone marker on its grave and peace returned to the village. Cat, Fox and Frog . . .
Woodblock print by Utagawa Kuniyoshi 歌川 国芳 . The Kaibutsu Ehon　怪物絵本　("Illustrated Book of Monsters") is an 1881 book featuring woodblock prints of yōkai, or creatures from Japanese folklore. 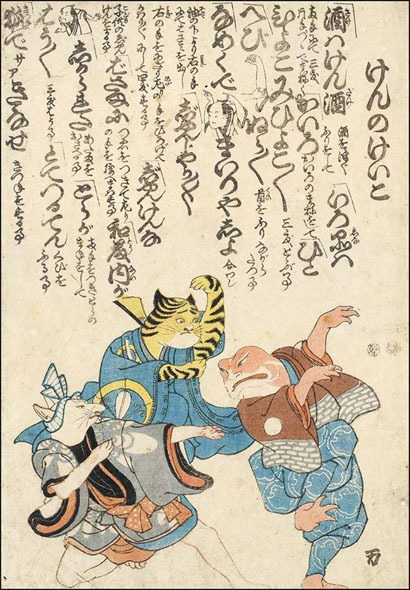 Illustrated by painter Nabeta Gyokuei, the book is modeled after the influential works of Toriyama Sekien, an 18th-century scholar and ukiyo-e artist known for his attempt to catalog the many species of yōkai in Japan. There is a tradition in the Nabéshima family that, many years ago, the Prince of Hizen was bewitched and cursed by a cat that had been kept by one of his retainers. This prince had in his house a lady of rare beauty, called O Toyo: amongst all his ladies she was the favourite, and there was none who could rival her charms and accomplishments. One day the Prince went out into the garden with O Toyo, and remained enjoying the fragrance of the flowers until sunset, when they returned to the palace, never noticing that they were being followed by a large cat. Having parted with her lord, O Toyo retired to her own room and went to bed. At midnight she awoke with a start, and became aware of a huge cat that crouched watching her; and when she cried out, the beast sprang on her, and, fixing its cruel teeth in her delicate throat, throttled her to death. What a piteous end for so fair a dame, the darling of her prince's heart, to die suddenly, bitten to death by a cat! Then the cat, having scratched out a grave under the verandah, buried the corpse of O Toyo, and assuming her form, began to bewitch the Prince. "This is a marvellous thing, that a guard of a hundred men should thus be overcome by sleep. Of a surety, the spell that is upon my lord and upon his guard must be the work of witchcraft. Now, as all our efforts are of no avail, let us seek out Ruiten, the chief priest of the temple called Miyô In, and beseech him to put up prayers for the recovery of my lord." And the other councillors approving what Isahaya Buzen had said, they went to the priest Ruiten and engaged him to recite litanies that the Prince might be restored to health. "Sir, I pray you to tarry a little: I have something to say to you." "At your reverence's service. What may you please to want?" "Pray be so good as to step up here, and have a little talk." "By your reverence's leave;" and with this he went upstairs. "Sir, I cannot conceal my admiration that you, being so young a man, should have so loyal a spirit. I am Ruiten, the chief priest of this temple, who am engaged in praying for the recovery of my lord. Pray what is your name?" "My name, sir, is Itô Sôda, and I am serving in the infantry of Nabéshima. Since my lord has been sick, my one desire has been to assist in nursing him; but, being only a simple soldier, I am not of sufficient rank to come into his presence, so I have no resource but to pray to the gods of the country and to Buddha that my lord may regain his health." "Your purpose is, indeed, a good one; but what a strange [pg 203] sickness this is that my lord is afflicted with! Every night he suffers from horrible dreams; and the retainers who sit up with him are all seized with a mysterious sleep, so that not one can keep awake. It is very wonderful." "Yes," replied Sôda, after a moment's reflection, "this certainly must be witchcraft. If I could but obtain leave to sit up one night with the Prince, I would fain see whether I could not resist this drowsiness and detect the goblin." At last the priest said, "I am in relations of friendship with Isahaya Buzen, the chief councillor of the Prince. I will speak to him of you and of your loyalty, and will intercede with him that you may attain your wish." "Indeed, sir, I am most thankful. I am not prompted by any vain thought of self-advancement, should I succeed: all I wish for is the recovery of my lord. I commend myself to your kind favour." "Well, then, to-morrow night I will take you with me to the councillor's house." "Thank you, sir, and farewell." And so they parted. On the following evening Itô Sôda returned to the temple Miyô In, and having found Ruiten, accompanied him to the house of Isahaya Buzen: then the priest, leaving Sôda outside, went in to converse with the councillor, and inquire after the Prince's health. "And pray, sir, how is my lord? Is he in any better condition since I have been offering up prayers for him?" "Indeed, no; his illness is very severe. We are certain that he must be the victim of some foul sorcery; but as there are no means of keeping a guard awake after ten o'clock, we cannot catch a sight of the goblin, so we are in the greatest trouble." "I feel deeply for you: it must be most distressing. However, I have something to tell you. I think that I have found a man who will detect the goblin; and I have brought him with me." "Indeed! who is the man?" "Well, he is one of my lord's foot-soldiers, named Itô Sôda, a faithful fellow, and I trust that you will grant his request to be permitted to sit up with my lord." "Certainly, it is wonderful to find so much loyalty and zeal in a common soldier," replied Isahaya Buzen, after a moment's reflection; "still it is impossible to allow a man of such low rank to perform the office of watching over my lord." "It is true that he is but a common soldier," urged the priest; "but why not raise his rank in consideration of his fidelity, and then let him mount guard?" "It would be time enough to promote him after my lord's recovery. But come, let me see this Itô Sôda, that I may know what manner of man he is: if he pleases me, I will consult with the other councillors, and perhaps we may grant his request." [pg 204] "I will bring him in forthwith," replied Ruiten, who thereupon went out to fetch the young man. "So I hear that you are anxious to be permitted to mount guard in my lord's room at night. Well, I must consult with the other councillors, and we will see what can be done for you." When the young soldier heard this he was greatly elated, and took his leave, after warmly thanking Buiten, who had helped him to gain his object. The next day the councillors held a meeting, and sent for Itô Sôda, and told him that he might keep watch with the other retainers that very night. So he went his way in high spirits, and at nightfall, having made all his preparations, took his place among the hundred gentlemen who were on duty in the prince's bed-room. Now the Prince slept in the centre of the room, and the hundred guards around him sat keeping themselves awake with entertaining conversation and pleasant conceits. But, as ten o'clock approached, they began to doze off as they sat; and in spite of all their endeavours to keep one another awake, by degrees they all fell asleep. Itô Sôda all this while felt an irresistible desire to sleep creeping over him, and, though he tried by all sorts of ways to rouse himself, he saw that there was no help for it, but by resorting to an extreme measure, for which he had already made his preparations. Drawing out a piece of oil paper which he had brought with him, and spreading it over the mats, he sat down upon it; then he took the small knife which he carried in the sheath of his dirk, and stuck it into his own thigh. For awhile the pain of the wound kept him awake; but as the slumber by which he was assailed was the work of sorcery, little by little he became drowsy again. Then he twisted the knife round and round in his thigh, so that the pain becoming very violent, he was proof against the feeling of sleepiness, and kept a faithful watch. Now the oil paper which he had spread under his legs was in order to prevent the blood, which might spurt from his wound, from defiling the mats. "I am not used to seeing you here. Who are you?" "My name is Itô Sôda, and this is the first night that I have been on guard." "A troublesome office, truly! Why, here are all the rest of the guard asleep. How is it that you alone are awake? You are a trusty watchman." "There is nothing to boast about. I'm asleep myself, fast and sound." "What is that wound on your knee? It is all red with blood." "Oh! I felt very sleepy; so I stuck my knife into my thigh, and the pain of it has kept me awake." "What wondrous loyalty!" said the lady. "Is it not the duty of a retainer to lay down his life for his master? Is such a scratch as this worth thinking about?" Then the lady went up to the sleeping prince and said, "How fares it with my lord to-night?" But the Prince, worn out with sickness, made no reply. But Sôda was watching her eagerly, and guessed that it was O Toyo, and made up his mind that if she attempted to harass the Prince he would kill her on the spot. 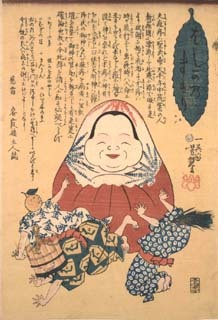 The goblin, however, which in the form of O Toyo had been tormenting the Prince every night, and had come again that night for no other purpose, was defeated by the watchfulness of Itô Sôda; for whenever she drew near to the sick man, thinking to put her spells upon him, she would turn and look behind her, and there she saw Itô Sôda glaring at her; so she had no help for it but to go away again, and leave the Prince undisturbed. At last the day broke, and the other officers, when they awoke and opened their eyes, saw that Itô Sôda had kept awake by stabbing himself in the thigh; and they were greatly ashamed, and went home crestfallen. That morning Itô Sôda went to the house of Isahaya Buzen, and told him all that had occurred the previous night. The councillors were all loud in their praises of Itô Sôda's behaviour, and ordered him to keep watch again that night. At the same hour, the false O Toyo came and looked all round the room, and all the guard were asleep, excepting Itô Sôda, who was wide awake; and so, being again frustrated, she returned to her own apartments. "Well, then, how shall we kill the foul thing?" "I will go to the creature's room, as if nothing were the matter, and try to kill her; but in case she should try to escape, I will beg you to order eight men to stop outside and lie in wait for her." "What message have you brought me from my lord?" "How dare you behave like this to one of your lord's ladies? I will have you dismissed;" and she tried to strike Sôda with the halberd. But Sôda fought desperately with his dirk; and the goblin, seeing that she was no match for him, threw away the halberd, and from a beautiful woman became suddenly transformed into a cat, which, springing up the sides of the room, jumped on to the roof. Isahaya Buzen and his eight men who were watching outside shot at the cat, but missed it, and the beast made good its escape. So the cat fled to the mountains, and did much mischief among the surrounding people, until at last the Prince of Hizen ordered a great hunt, and the beast was killed. But the Prince recovered from his sickness; and Itô Sôda was richly rewarded. Ayako Ishiguro is one of Japan’s most prolific cat illustrators. 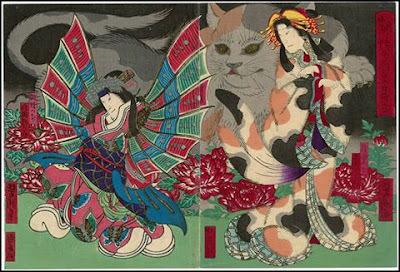 Her style is influenced by a mix of manga and traditional styles, and she’s published several books and held numerous exhibitions all featuring the humble feline. tr. by Virginia Skord in "Tales of Tears and Laughter".
. Yokai monsters 妖怪　- ABC list .